Not only has Irene Ghobrial, M.D. dedicated her professional life to finding lifesaving treatments for cancer, but over the past few months she has dedicated her leisure time to training for a half marathon in Alaska, to raise funds for cancer research. Ghobrial has trained with The Leukemia & Lymphoma Society’s (LLS) Team In Training (TNT), the non-profit’s endurance training program. Ghobrial, a Dana-Farber Cancer Institute (DFCI) physician-scientist, has been closely affiliated with LLS for many years, having received numerous LLS grants for blood cancer research. Ghobrial’s research includes identifying what causes myeloma cells to become drug resistant and understanding how to treat premalignant cancer conditions before they become more serious blood cancers. Ghobrial also co-leads an LLS and DFCI collaboration, through LLS’s Therapy Acceleration Program, to bring clinical trials to local community cancer centers. She currently leads an LLS Specialized Center of Research (SCOR) grant, and also has a Translational Research Program grant. Learn more about Dr. Ghobrial’s research here. Ghobrial is dedicated to the quest for cancer cures outside the lab as well. She has been training with TNT’s Flex program, which Ghobrial says allows her to train “on my own crazy schedule,” but still provides the same TNT training, team experience, workouts, fundraising and goals. Dr. Ghobrial travelled from Boston to Alaska to run her first half marathon in the Anchorage Mayor’s Marathon on June 18. 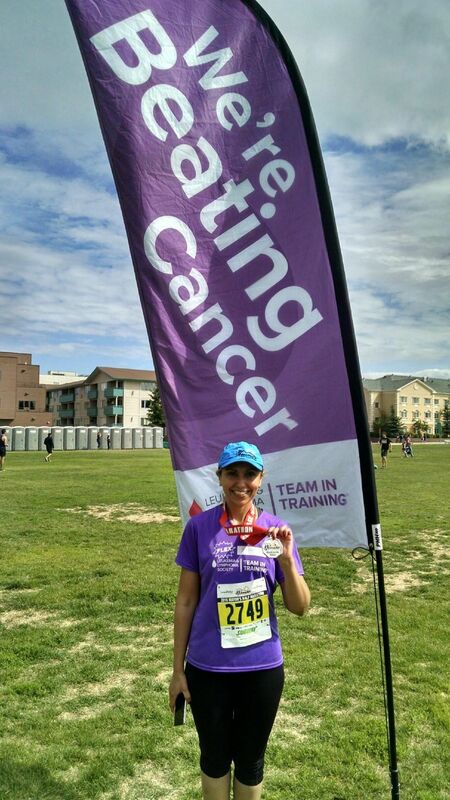 “I always wanted to run for The Leukemia & Lymphoma Society,” says Ghobrial. “I can’t say enough good things about LLS’s research, patient care and fundraising campaigns. Whenever there is an LLS event in Boston…a Light The Night walk, Man Woman of the Year event, and now TNT, I always try to volunteer.” Ghobrial says she had a conflict with the TNT Boston Marathon event, and when she saw the half marathon in Alaska listed, thought, “how cool to go run in Alaska,” so she signed up. Ghobrial ran in honor of her nurse practitioner, Janet Kunsman, who passed from cancer a year-and-a-half ago. “She was very special,” Ghobrial noted.